Expedia has some excellent New York travel packages Bundling your bookings is one of the simplest ways to save money and time — and get your trip off on the right foot. Wouldn't it be nice to earn savings up to 15%*? Book your family's travel package on Expedia today! With more than 400 partner airlines and 321,000 properties to mix and match from on our universal database, you won't have any problems designing your ideal holiday. Still undecided? 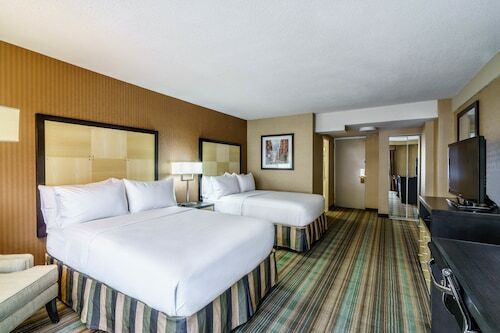 You won't pay us a cancellation fee if you change your mind for almost any reservation. There are stacks of amazing things you can do when you visit a new place. So why not get your trip to New York off to a flying start by checking out some of our recommendations? After all – out there starts here! With such a variety of famous attractions in one place, there'll never be a dull moment in New York! First things first, be sure to take some selfies out the front of the Statue of Liberty and Empire State Building. After you've struck those from the bucket list, you'll still have Ellis Island and Brooklyn Bridge to explore! You're going to find yourself surrounded by interesting attractions, including Macy's and Radio City Music Hall. If you're eager to get the most out of your stay, then check out the One World Trade Centre and New York Stock Exchange. You'll discover a number of things to do at Rockefeller Centre! This leading tourist area is loaded with attractions and activities to fill your day. There's an excellent range of things to keep you busy in this destination. What year was it built and what events occurred there? Try to find the answers to these questions during a visit to Chrysler Building, a building of historic importance. Still have time on your hands? There are some sights you can give the flick, but there are some you simply can't miss! No journey would be complete without a photo in front of Grand Central Terminal, a distinct local symbol. Life is either a bold adventure or nothing at all, so why not plunge into some new and exciting experiences? Got some time on your side? Head to our New York things to do page for a full list of activities. Securing comfortable places to stay is key when planning cheap holidays or luxury getaways. 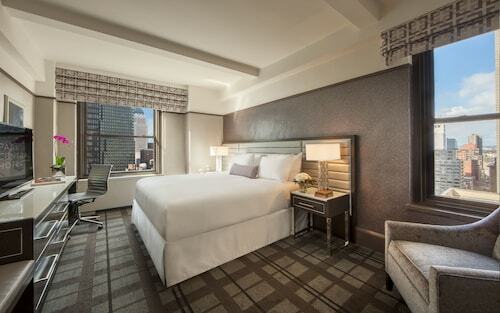 Luckily, New York has 676 accommodations, so you'll have loads of options. If the thought of a generously stocked minibar and an oversized bathtub sounds good to you, grab a drink and steep yourself in luxury at The St. Regis New York (Two East 55th St) or the Mandarin Oriental, New York (80 Columbus Circle at 60th Street). Prefer somewhere less expensive? 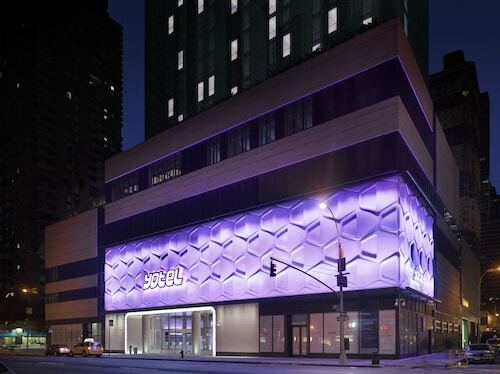 Have a look at the New York Marriott Downtown (85 West St) and the DoubleTree by Hilton Hotel New York - Times Square South (341 West 36th Street). Another great option is to stay close to Empire State Building. You can make this happen by securing a room at The Langham, New York, Fifth Avenue, which is just 0.1 miles (0.2 km) away. 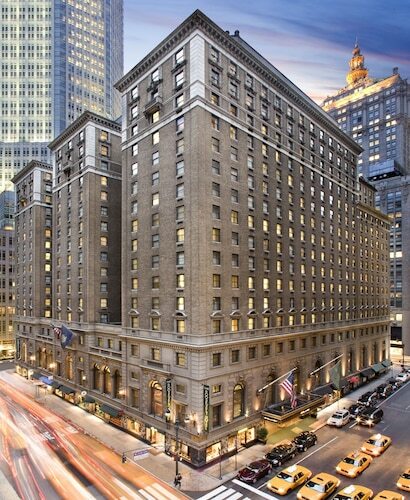 Also popular is The Chatwal, a Luxury Collection Hotel, New York City, a mere 0.5 miles (0.8 km) away. Have you booked your plane tickets for your trip to New York yet? When you land, prepare to step out into LaGuardia Airport (LGA). It's 6 miles (10 km) from here to the heart of town. This American cultural icon is a required part of any visit to New York, offering fabulous elevated views over the city. Visit New York’s colossal copper queen, a world-renowned beacon of liberty, democracy and hope. Visit this iconic square with its dazzling surroundings and vibrant mix of people, and see what makes New York tick. Visit this magnificent and bustling train station and take in its stunning design and regal scale. This sober landmark pays homage to the thousands who died on September 11, 2001. Since its creation in the 1930s, this complex of buildings has been a focal point of New York commerce and entertainment. This historic square has been a centre for social activism for decades, and is now building a strong reputation for high-quality food. This iconic suspension bridge offers views of the Statue of Liberty from the East River. 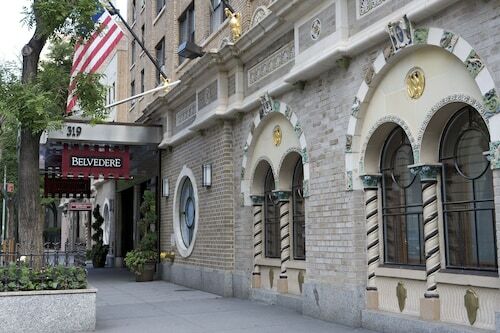 Go shopping, see art and stroll beside Central Park on this famous Midtown street. The home of global finance also offers a fascinating historical excursion. One of New York City’s first skyscrapers is a historic feat of architectural engineering and design, and remains one of the city’s most iconic and photographed buildings. One of the world’s best-known art galleries is as exciting from the outside as it is from inside. Relive 60 years of immigration history as you explore the exhibits of this poignant museum. Find out if your ancestors passed through as they entered the U.S. This stylish park at the southernmost tip of Manhattan is a destination for one of the best sunsets in the city. With many acres of rolling hills, wooded alcoves and lush gardens, this park is a great place in Brooklyn for a lazy afternoon or an outing with the family. Few other places in the world get as much credit for creating and nurturing American music genres as does this famous theater. Join the millions of people who have seen a show at this beautiful and historic venue, which is a marvel of modernist architecture and design. Explore the fascinating relics and works of art in “the little chapel that stood,” the oldest surviving church building in Manhattan. Besides its many attractions, Jersey City’s sprawling waterfront park offers beautiful views of the Statue of Liberty, Ellis Island and the Manhattan skyline. See natural wonders from mammoth dinosaurs to delicate butterflies to outer space in this vast museum in the heart of Manhattan. With the iconic Flatiron Building presiding over you, enjoy a peaceful retreat in Midtown at one of Manhattan’s most iconic parks. In some ways it is similar to your neighborhood market, except this indoor food hall has a verve for the gourmet that rivals anywhere else in Manhattan. Glimpse an ultra-luxurious world in the two towers of the splendid Time Warner Center, home to some of New York City’s finest hotels, stores, bars and restaurants. In the middle of this traffic circle is an iconic monument that celebrates the great explorer and marks the transition from the city to the relaxing atmosphere of Central Park. Meet the iconic library lions, explore the Rose Room and marvel at millions of books at New York City’s flagship library. A standout building in an impressive area, this church is filled with art and relics and is the final resting place of many prominent Americans. At this somber memorial, pay a personal tribute to the firefighters who perished saving others during 9/11 and other disasters. Visit the dazzling theater district of one of the world’s most exciting cities. Enjoy the shopping, dining and street entertainment as well. Artifacts, images and stories re-create the quiet heroism of the long recovery period after the terrorist attack on New York City’s World Trade Center. Stop for a picnic lunch at a shaded table, create some art, ride the carousel or play chess, ping-pong or boules at this amazing multi-use park in midtown Manhattan. Learn the real stories of American immigrants from the 1860s and onward as you tour recreated apartments in a historic Manhattan tenement building. Go on a luxury shopping trip and enjoy gourmet dining in a beautiful mall that has stunning views of Jersey City over the Hudson River. Venture into one of the world’s most iconic buildings, which harks back to a time of industrial growth and art deco flair. Sunbathe alongside locals, enjoy views of Manhattan from the bike paths or enjoy gourmet food at this popular Brooklyn park. Visit this downtown street, that connects Manhattan’s Greenwich Village with East Village, for its trendy nightclubs, high-end fashion stores and Italian pastry shops. Enjoy breathtaking views of the city from the observation platform of the tallest building in the Western Hemisphere, near to where the Twin Towers once stood. 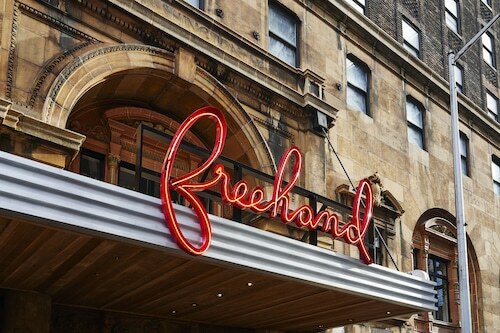 Make sure you don’t miss this highlight of the Lower East Side’s thriving contemporary art scene, which has an interior as remarkable as its iconic exterior. Admire the range of Gothic and Romanesque styles in the artistic displays that decorate the walls of this reconstructed convent. Imagine yourself living in this grand New York City mansion surrounded by fine furniture and amazing artwork from renowned masters. In a city with many pretty parks, this is one of the most beautiful. You may recognize its iconic arch and fountain from a movie or postcard. A favorite of locals and tourists alike, this walkway is one of the best in New York City and a romantic place to go with a date. Book a place in the audience for a live taping of a television show at this famous theater and studio, where many well-loved U.S. shows have been filmed. Experience the changing seasons in this leafy inner-city sanctuary, where specialty gardens and heritage pavilions showcase plants from around the world. Be amazed by the beauty of handicrafts at New York City’s premier space dedicated to art created in glass, clay, cloth, metal and wood. Browse more than 21,000 paintings, sculptures, photos and other modern artistic works in this innovative complex that celebrates living artists. Get a behind-the-scenes look at one of the most famous television studios in New York City, where some of the nation’s best-loved shows are filmed. Enjoy the New York panorama from the site of an iconic photo depicting workers taking a lunch break on a construction beam high in the sky. Immerse yourself in the visual delights of modern art, including some of the most famous pieces in the world, at New York City’s beloved museum. Marvel at the neo-Gothic twin spires of one of the largest Catholic churches in the United States and light a candle beside the acclaimed religious artworks. Admire the remarkable architecture, beautiful music and spiritual ambiance of this historic landmark just north of Central Park. Whether you’re performing here or more likely watching a performance, enjoy the rich surroundings of one of the world’s most renowned music performance halls. See the Egyptian antiquities, a rotating selection of international art and a mammoth collection of American artworks in this impressive museum. From Roman art to Rembrandt and beyond, explore the art and culture of civilizations from across the ages in one of the world’s most acclaimed art museums. Discover this lovely little park as you take a walking tour of lower Manhattan. Stop at its visitor center to pick up information for the rest of your trip. Feel worlds away from the hustle and bustle of New York City as you stroll along the Hudson River in the Upper West Side’s famous waterfront park. See some of the world’s greatest performing arts events in one of the most culturally rich cities on the planet in this large architecturally impressive complex. A riverfront gathering place for the world’s most powerful political leaders, this building is also home to a surprisingly diverse array of tourist attractions. Take a nostalgic journey on this beautifully restored antique carousel enclosed within a sleek glass pavilion overlooking the Brooklyn Bridge. Feel inspired, challenged and moved at one of the United States’ oldest and largest nonprofit contemporary art institutions, where experimental art flourishes. Delve into the rich cultural offerings of the Lower East Side by spending some time at this renowned contemporary art gallery, housed in an award-winning building. A skyscraper that holds the headquarters of one of the world’s most famous newspapers and is also an important piece of New York City’s architectural history. Admire the architectural beauty, innovation and environmental sustainability of one of New York City’s best-known modern skyscrapers, which rises 46 floors high. Some of the world’s most exciting bands perform at this trendy but intimate venue that has great acoustics and frequently hosts big-name artists. Attend some of the world’s most famous stage shows, such as the internationally renowned phenomenon Hamilton, at this historic theater in the heart of Broadway. See a big-name show in the opulent auditorium of this well-known theater, which is beautifully designed and full of history. Eat a pastrami sandwich at this classic New York deli, then stock up on gifts from an extensive collection of kitchen appliances and gourmet foods. Pose for an iconic New York photo at one of the city’s most talked-about landmarks, a striking retail space and work of art that was 12 years in the making. Excellent overall experience. Check in was quick and efficient, and we were upgraded by our check in person. Room was spacious, clean and comfortable. Exelent localization. Storic hotel in central city with good ground transport connections. Rooms were small, no ventilation in restroom causing a lot of moisture. Other than that great location and staff. Cool artsy rooms with everything you need. Great spaces in the hotel for hanging out, having drinks with friends and eating great meals. Very cool hotel where you could spend a week and never get bored.